If you’re trying to determine your kid’s free-range or home-alone skills, check out these resources! The Children Youth and Family Consortium at the University of Minnesota has an extensive to-do list for parents preparing their kids to stay home alone. Your children should know what to do if they are accidentally locked out, get into arguments with siblings or need to respond to a stranger at the door. See tinyurl.com/home-alone-uofm. The Jacob Wetterling Resource Center provides education, presentations and information on age-appropriate safety rules, cyber-bullying, sexual abuse, crisis assistance and Internet and cell-phone safety. See tinyurl.com/jacob-w-center. Join the conversation at facebook.com/MNParentMag. Our children need more time outdoors. Letting them roam free, however, makes many of us a bit nervous. How can parents find balance? We’ve all seen those Facebook posts and chain emails that recall a simpler childhood — free of cell phones and full of outdoor adventures with boundaries in the form of a neighbor’s corner lot and the end of play time determined by the street lamps flickering on at dusk. We look back fondly on biking to school and epic games of tag, twisting through a dozen semi-familiar backyards. But now, parents ourselves, we question the previous generation’s seemingly apathetic lack of concern for our safety, and we become our own generation’s inevitability — helicopter parents — overscheduled, over diagnosed, over concerned, overworked, over informed. Pinterest perfect, tightly wound, earnest and FUN, and worried sick. The pendulum, without fail, eventually swings the other way. A counter-movement has been building in recent years. It’s called free-range parenting. Fueled at first by a desire for less screen time, parents were determined to get kids out of the house and to pass on the gifts of their own independent childhoods, lived autonomously and, almost entirely, outdoors. The movement began in earnest in 2008, when Lenore Skenazy’s editorial for The New York Sun — Why I Let My 9-Year Old Ride the Subway Alone — went viral. The explosive attention only strengthened Skenazy’s belief in her decision. She coined the term “free-range kids” — and founded freerangekids.com — to describe her non-hovering parenting style. She also wrote a book: Free-Range Kids: How to Raise Safe, Self-Reliant Children (Without Going Nuts with Worry). There’s an app now as well. • A brother and sister, ages 10 and 6, were spotted walking home from the playground in Maryland last December. Their parents were investigated for neglect. In April, police picked the kids up again on a walk home after a call from a concerned citizen. Instead of bringing the children home like they did the first time, police took them directly to Child Protective Services without the parents’ knowledge, leaving them worrying for hours. • A 6-year-old boy was allowed to play alone in a field 150 yards from his house in Austin, Texas. The family’s children were questioned extensively by CPS after a neighbor called the police. • Chicago author Kim Brooks detailed her story with a piece on Salon.com last year: She left her 4-year-old son in the car playing with an iPad while she ran into a store for five minutes. She avoided charges by doing 100 hours of community service and attending parenting education classes. Skenazy — who argues that crime rates are at a 50-year low and that car accidents are far more dangerous for kids than roaming free — believes free-range parenting is a civil-rights issue for parents and children. She’s become an advocate for parents who resent the so-called nanny state of nosy neighbors. Her book includes a card for kids to carry when they’re roaming free to set bystanders’ minds at ease. 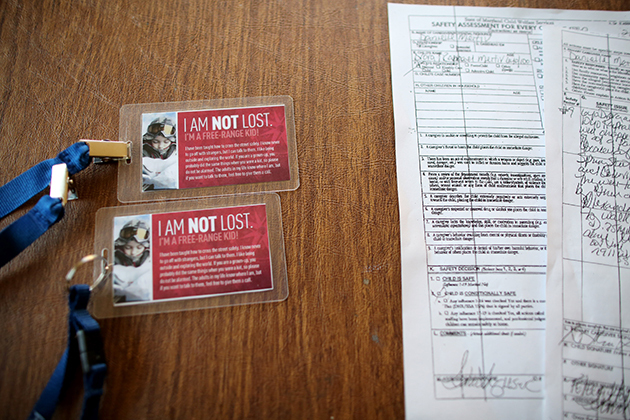 It reads: “I am not lost. I’m a free-range kid,” and includes parent contact information on the back, plus an explanation of the free-range philosophy. Many Minnesotans are sensitive to the topic of child abduction because of the much-publicized 1989 Jacob Wetterling case, which remains unsolved 25 years later (though new information emerged in October 2015). At first glance, it would seem that Feigh and Skenazy are on the same page. However, Feigh worries about the concept of free-range parenting as a blanket movement which encourages “all kids” to get out and explore in the same way. Instead, Feigh suggests an individual approach: Know your child’s capabilities, personality and comprehension of age-appropriate safety rules. Feigh also believes there’s a big difference between intentional free-range exploration as mutually agreed upon by parent and child versus need-based alone time dictated by a lack of child-care resources. Does the child want this? Does the parent need this? What safety preparations have been made? What practice steps led up to the hour alone at the park? These things make a difference. We’re unsure of the law, our rights and our responsibilities. In Minnesota, there’s no clearly defined law about kids being alone at home, at the playground or in cars. Most of us aren’t neglecting our kids. In fact, many parents sincerely worry about hindering their kids’ development, worried that, by over-worrying, we’re removing so much risk they’ll never be able to cope when we finally do set them free in the real world. But, most of all, we fear we couldn’t live with the consequences if something unthinkable happened while our kids were in our care. Why are we so darn afraid of the worst, most unlikely scenarios? Skenazy blames media saturation for this phenomenon. Adding to the sensationalist media onslaught is our modern turn toward a litigious society — everything’s seen through the eyes of risk. We’re also a culture of experts: There’s a blog on that, an app for that and a how-to manual. “In terms of parenting, that translates to a sort of thinking that every decision we make can either boost our kid to Harvard or ruin them forever,” Skenazy said. In the meantime, if you’re struggling with the balance between safety and independence, both tempted by and frightened by the idea of free-range parenting, building your sense of community might be a good place to start. Get to know your neighbors. Talk about it. Take turns supervising the park. With technology increasing our tendency to disconnect, it sometimes feels like we’re in each other’s business, but not in each other’s lives. This, naturally, makes it hard to feel safe, think rationally and parent intentionally. Neither kids nor adults were meant to explore this world completely alone. Though Minnesota doesn’t have a home-alone age law or a law restricting leaving children alone in automobiles, the general recommendation is that children shouldn’t be left home alone until age 8. Parents who leave children age 7 and younger home alone may be subject to maltreatment evaluations. Factors such as the child’s ability, risks present, duration of time left alone and the reason for time left alone would be considered. Learn more about Minnesota’s child neglect laws at mn.gov/dhs. Minnesota has a state-supervised, county-administered child-welfare system. • Age 14-17 left unsupervised while parents are absent for more than 24 hours. • In Dakota County, it’s acceptable for children age 11-14 to babysit with the expectation that the parent, guardian or caretaker will be returning to supervise the children later that same day. It’s acceptable for ages 15 and older to babysit younger children for more than 24 hours. Jen Wittes, a frequent contributor to Minnesota Parent, lives in St. Paul.